If you need to create a surface mount interconnect between two printed circuit boards, Mill-Max SMT Strip Sockets and Pin Headers provide the perfect combination for this application. Mill-Max has added a heavier gauge option to our line of SMT interconnect headers with the introduction of two new connectors. Our latest SMT male pin header strips feature sturdy .030" (0,76mm) diameter pin tails which plug easily into a variety of standard Mill-Max mating socket strips. The mating sockets are available in through-hole, right-angle and SMT configurations. 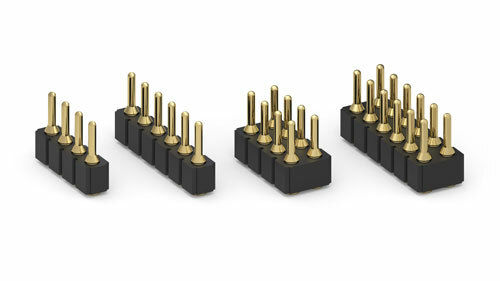 These header and socket combinations are rated at 4.5 amps per pin for a 10° C temperature rise above ambient. The headers feature a round stub-tail termination providing the benefit of a reduced solder footprint inside the package outline. The .008" floating pin design compensates for the peaks and valleys found in uneven solder paste application on the board surface, promoting good solder joints. The .030" (0,76mm) diameter pins provide extra strength for applications where there is the potential for rough handling, such as for field service repairs or blind mating situations.